Why Do Outreach? Schools are in a powerful position to bring critical information about affordable health insurance to students and their families, and to identify and enroll children in health insurance so they have access to preventive care and other important health care benefits. The importance of this work cannot be overstated. The extensive benefits for everyone involved include better student, teacher and school performance. Parents, of course, benefit by seeing their children flourish. Schools Can Secure Payment for School Health Services. A critically important 2014 Medicaid rule change by the Centers on Medicare & Medicaid Services (CMS)24 now allows public school-based providers to receive payment for health services provided to students enrolled in Medicaid, even if the services are furnished without charge to other students. Called the Free Care Rule, it has expanded the ability of school-based providers that meet Medicaid requirements to receive Medicaid payment for providing Medicaid services to Medicaid eligible students, such as immunizations, health check-ups and services provided by on-site school clinics. Recognizing the important role that school health services can play, CMS states that “whether implemented for children with special needs under the Individuals with Disabilities Education Act (IDEA), or for routine preventive care, on-going primary care and treatment in the form of a school-based or linked health clinic, school-centered programs are often able to provide medical care efficiently and easily without extended absences from school." Parents are Educated and Empowered to Do What’s Best for their Children. Low-income parents struggling to make ends meet often do not have the time or resources to learn about health coverage options for their children. Schools are powerful messengers and can provide critical information and connect children to quality care. They can educate parents and empower them to act. Who Does Outreach? When thinking about outreach activities, the logical person to begin coordinating and thinking strategically about spreading the message will likely be one affiliated with the school health service. This person should begin the planning and include the superintendent’s office, coaches, teachers, nurses, social workers and communications department staff and develop an outreach strategy or campaign. Community partners to consider engaging include your local health care advocates and providers; local enrollment assisters; local media; legislators; local businesses and other community leaders. How to Conduct Outreach. The CDF and AASA team has identified four key steps to planning your health insurance outreach campaign. Edinburg Consolidated ISD recognized that some hourly wage school employees are unable to afford the employee offered insurance and many didn’t know there were other options available for their children, including CHIP, Medicaid and the ACA’s Marketplace. 1. The first step is to clearly determine and define who you want to reach with your campaign. Is there census, school employee or community data that show where the greatest needs are? Gaining knowledge about the number of uninsured children living within your school district's boundaries can help team leaders set reasonable goals. In the IDENTIFY section you read about determining how many students are uninsured in your district. The guide walks you through how to use the U.S. Census website. Don't overlook your own school employees whose children may be eligible. 2. The second step is to fine tune your outreach strategy. Once you select your target audience, think through the best ways to connect with them. Determine the type of outreach. There are many options for getting your message out. For example, you can use your school website, social media channels, radio and TV spots, newspaper articles and text messages. You may also want to implement robocalls to families, have t-shirt sales, informational brochures, short flyers and posters or put an announcement on the school marquee. To make sure families know what information is needed to enroll their children in health coverage, include a checklist of required items in your radio/TV talking points, flyers, brochures and online information. See examples of these outreach strategies. For additional outreach resources, the U.S. Department of Health and Human Services and the U.S. Department of Education released the Healthy Students, Promising Future toolkit.28 This toolkit offers practical “high-impact opportunities" for helping schools strengthen coordination between health and education systems at the local and state levels. In addition, the Centers for Medicare & Medicaid Services launched the Connecting Kids to Coverage Campaign29 and partnered with organizations across the country to improve children's health. The Connecting Kids to Coverage Campaign has a wealth of excellent materials that are free, customizable, and available in many languages, including English, Spanish, Chinese, Korean, Vietnamese, Haitian Creole, Hmong, Portuguese and Tagalog. Alief ISD in Houston, TX capitalized on the health care marketplace open enrollment season by hosting enrollment events that would attract parents of uninsured children. To plan their outreach, they partnered with SRA, an organization in the Houston area that provides trained navigators to help families apply for health insurance. After careful evaluation of their first year of collaboration, they decided to increase advertising and host events early in the evenings as parents were coming home from work. Alief and SRA reviewed the calendar and selected three to four days during each month of the open enrollment period that wouldn’t clash with the district’s testing schedules or SRA’s heavy enrollment times. Alief produced flyers directing families to specific campuses in the evening for health insurance marketplace enrollment assistance and Medicaid/CHIP services. All families were seen by appointment and walk-ins were scheduled with either SRA or at another location on a different date. Alief’s health outreach coordinator reviewed the details of what each family needed to bring to their appointment. Each person who scheduled an appointment was also contacted by SRA for reminders and to answer any additional questions they might have. Through this partnership, Alief ISD was able to assist an average of 12 families per evening. As a result of the changing economy, you may have recently lost health insurance for yourself and your family. Our ______ school cares about the health and well-being of our students. Did you know that your child may qualify for the Children's Health Insurance Program or Medicaid? This Saturday, _______, outreach workers will be available to help families apply for these programs and to answer questions about other health care resources. For more information, please check the school website, front office or call (___) ___-____. _______ school wants every eligible child to have health coverage. Did you know that your child may qualify for the Children’s Health Insurance Program or Medicaid? A family of 4 making up to $49,959 may qualify. For more information on ways to apply please check the school website, front office or call (___) ___-____. Did you know that your child may be eligible for health insurance through the Children’s Health Insurance Program or Medicaid? A family of 4 can make up to $49,959 to qualify. The programs offer comprehensive benefits including well-child visits, immunizations and specialty care all for $50 or less per year. Would you like help applying for health coverage or do you want to learn more about the eligibility requirements? If so, please join us at the employee benefits information meeting where staff will be on hand to answer questions about these two programs. You can also visit the Employee Benefits website. 3. Organize events. Planning an event is one way to help reach your target community. School Events: Are there already existing events upon which to piggy-back? Ideal events for outreach include back-to-school nights, health fairs, report card days, parent nights, school registration period, open enrollment for the Health Insurance Marketplace, Christmas and Valentine's Day celebrations, etc. When planning school events, take into consideration the ideal time of year. Be prepared for your outreach event and consider what languages should be used in the resources offered. Make sure you are able to communicate with everyone who attends. Remember to visit the Outreach Tool Library on the insurekidsnow.gov website for resources in multiple languages. Mountain View School District in El Monte, CA partnered with the Children’s Defense Fund-CA, a local health care partner, and their local cable television channel to produce a show that would discuss the district’s health and wellness initiative. In this show, they described the district’s goals of reaching all uninsured students and enrolling them in health insurance. School district administrators sent messages to various audiences including students, parents, community organizations, elected officials and the general public. The show also featured a community health partner who talked about various health programs available to families in the El Monte community. It aired weekly and clips of the show were later used in outreach activities. 4. Develop a communications strategy. Start by assessing your district's internal communications and marketing resources and capacity. A communications plan can have a number of goals that align with your already existing district communications plan — no need to reinvent the wheel. Do you have an in-house district communications manager who can work with your team to develop a strategic communications plan for the school year? Your district likely has a school newspaper, a television spot and/or social media outlets that can easily support your activities. You should also consider community partners who have networks and additional resources of their own that can be helpful to your project. Be creative and consider what messages are important to the audiences you strive to reach. The Orleans Parish School District in New Orleans, Louisiana selected the traditional New Orleans fleur-de-lis as the primary image to be used in a series of promotional efforts throughout the community. 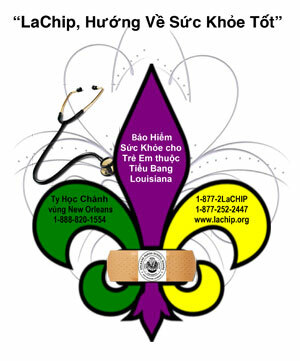 The logo, produced in three languages, included information about Louisiana's Children's Health Insurance Program (LACHIP). To maximize visibility, the district team placed this image on magnets, flyers and the district website. Step 2: Make the Ask. Step 3: Collect the Story. Step 4: Use the Story. Learn more about Story Collection. Share Your Story or read the stories of others. 5. Recognize stories are the most effective tool in your toolbox. Stories make programs and policy issues personal; they create connections between people. That is why sharing a story can be one of the most effective ways to communicate. Stories can create buy-in to do this work with district administrators and staff. 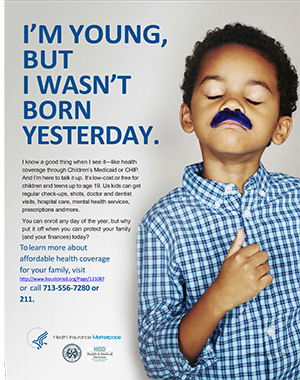 Stories can help families who may be reluctant to enroll their children or do not understand the importance of health insurance. Stories help build community partnerships and relay reasons why agencies should become engaged in this work. Stories are the most effective tool in your toolbox, because they help people understand and connect. The Children’s Defense Fund Leave No Child Behind® mission is to ensure every child a Healthy Start, a Head Start, a Fair Start, a Safe Start and a Moral Start in life and successful passage to adulthood with the help of caring families and communities. CDF provides a strong, effective and independent voice for all the children of America who cannot vote, lobby or speak for themselves. We pay particular attention to the needs of poor children, children of color and those with disabilities. CDF educates the nation about the needs of children and encourages preventive investments before they get sick, drop out of school, get into trouble or suffer family breakdown. CDF began in 1973 and is a private, nonprofit organization supported by individual donations, foundation, corporate and government grants. AASA, the School Superintendents Association, represents, works alongside, supports, and is the voice of superintendents and education leaders across the United States. Thirteen thousand strong and 151 years old, we remain committed to excellence and equity for each and every child in public schools. Leveraging our 49 state affiliates and national partners, we focus on developing school system leaders who can meet the challenges facing 21st century students and beyond.